The talent behind F&W’s Photo Tour of Berlin, Marta Greber creates and photographs beautiful recipes for her Tumblr, What Should I Eat for Breakfast Today? Here, she shares some of her favorite twists on healthy breakfasts. The secret to making a tasty, healthy breakfast lies in the ingredients and a will to try new things (like whole-grain porridge that tastes like apple pie). Besides giving you necessary energy, breakfast should be a pleasure, as it can set you in the right mood for the next 12 hours. Here, my five favorite breakfast tweaks. 1. Add herbs. Basil, mint and sage might be go-tos at dinner, but they can also add nutrients and flavor to breakfast, without fat. 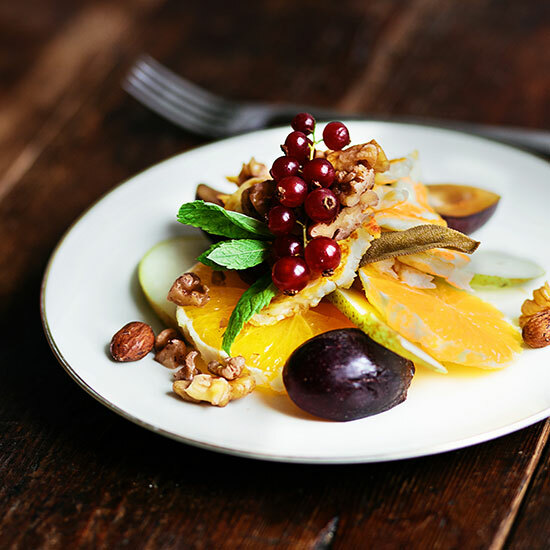 Fruits, nuts and herbs make a perfect morning combination. This recipe incorporates halloumi cheese sautéed in olive oil for calcium and good fats. 2. Substitute quinoa. This protein-packed ancient grain can easily update a morning porridge. My new favorite version of eggs Benedict features poached eggs over quinoa cakes. 3. Experiment with crêpes. Crêpes are a very popular breakfast dish in Europe, especially ones with fruits and cream cheese. Using chickpea flour, you can prepare a creamy, gluten-free version. This kind of flour is easy to make at home, too—simply grind dried chickpeas. 4. Start with cooked greens. Green is a good color, especially among vegetables. A bowl of greens with a poached egg and Parmesan is not only healthy, but delicious. You can also add another veggie color if you like. 5. Bake an oatmeal casserole. You may have had oats cooked on the stove or in muesli, but you can also prepare a baked oatmeal with your favorite fruits and different milks. This version combines bananas, strawberries, nuts and hazelnut milk.